Students with disabilities include students who have an Individualized Education Program (IEP) and those who have a 504 accommodations plan. In grades K-12, students with IEPs account for about 13% of the school-age population. Accurate counts of students with 504 plans are not available, but some studies have indicated that they comprise 1% or less of the school-age population. 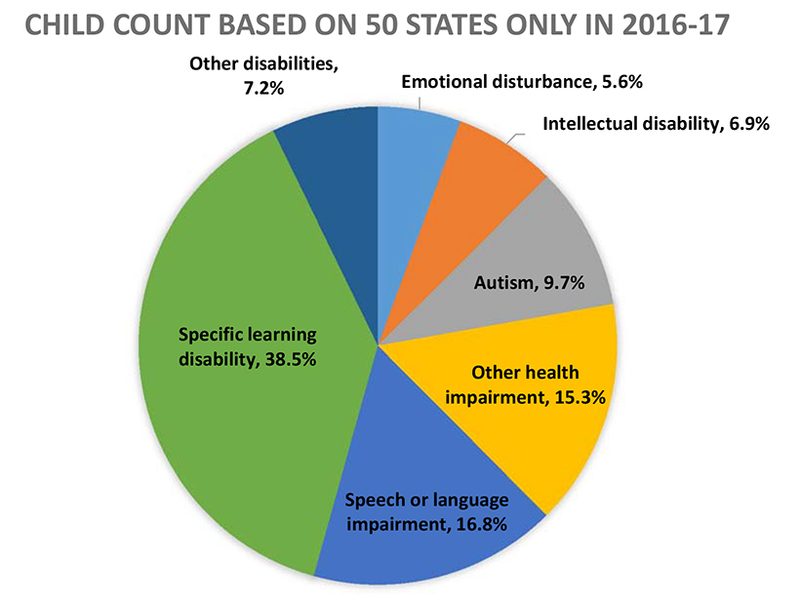 The percentages of some of the disability categories change with grade level. For example, speech language impairments are more prevalent in the earlier grades. Data on numbers of students in the categories of disability are collected each year through a child count process. Annual reports of these data may be found on the U.S. Department of Education website. *Other disabilities combined includes deaf-blindness (less than 0.02%), developmental delay (2.6%), hearing impairments (1.1%), multiple disabilities (2.1%), orthopedic impairments (0.6%), traumatic brain injury (0.4%), and visual impairments (0.4%). Data source: Child Count and Educational Environments 2016-17, data were extracted on 4/9/2018. Population: only includes age 6-21 in 50 states.